I mentioned our Notting Hill Housing Party – the summer party with an international theme. What did I wear in the end? I decided to use a 1950s Butterick pattern for a “fitted over-blouse”. 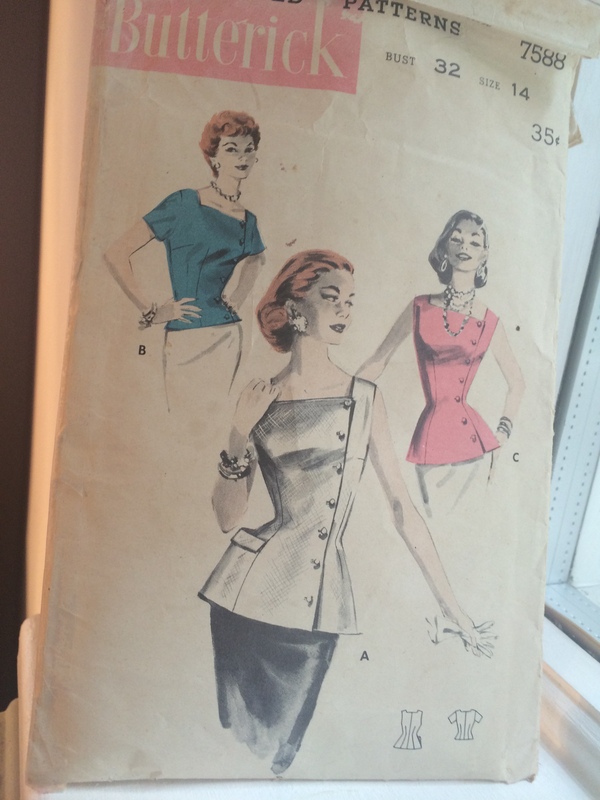 Although the blouse is fitted with darts (two in the front and one in the back) it looked a lot like some of the peplum tops that have been in fashion for a surprisingly long time. I never bought one in the shops mainly because they all seemed so short in the body, and the last thing I wanted was a flare coming out from the mid rib position. But I was hankering for this shape. In addition to it being delightfully retro with its square neck and asymmetric opening I thought it had something of an African vibe about it too. So this was the pattern I chose for my top. Unfortunately the pattern was missing the sleeve and the pocket, so that determined the view I could make up – view C. Of course I might draft the missing pieces another day. I measured it carefully as it is advertised for a 32″ bust, but there was plenty of ease. I added two inches to the length above the waist and did not shorten the hem, thinking I would judge the length when I made it up. I repositioned the seven buttons. 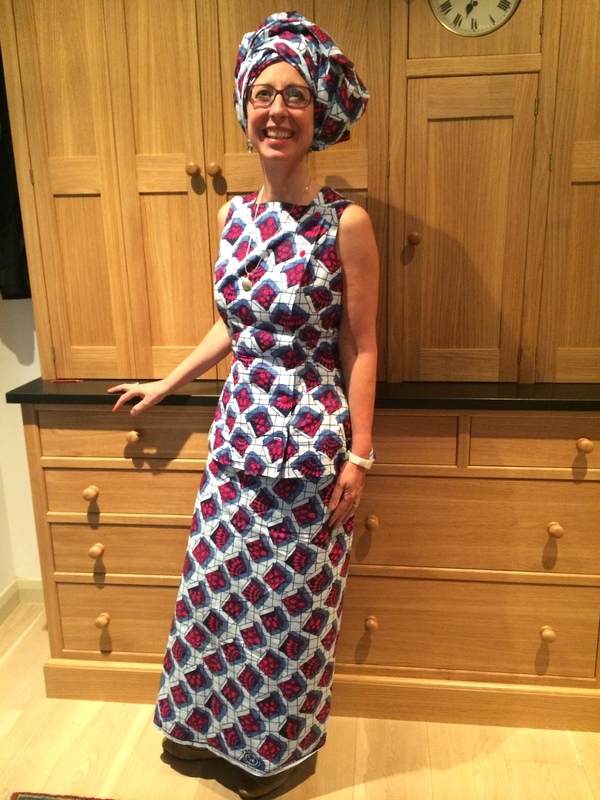 Many African printed fabrics have very large motifs which work best on a head to toe (literally) outfit. If you wear a floor length skirt, a fitted jacket or blouse and a head wrap you can do these large scale prints justice. 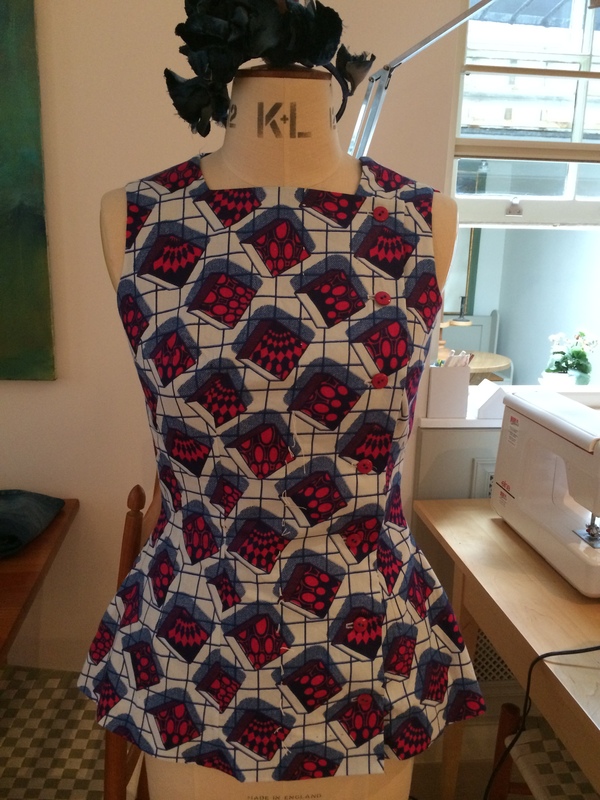 If you make a skirt or top you need to chose a smaller scale pattern. Equally the colours can be a bit strong for fair-skinned Brits. Many of the greens, oranges,purples and yellows look best under strong, bright sunlight, against the darkest and brightest complexions. British tweeds, linens and suitings often reflect our climate and environment too – muted purples and greens, soft greys and deep blues. So if you cross cultures with your fabric choices you need to pause and consider what you are doing. I chose a nice white, cerise and denim blue Ghanian “wax” print with shaded tumbling blocks that measure around 1″ square. Additionally the shapes and underlying check in the print was quite angular and geometric which I felt would suit this rather angular shaped over blouse. The pattern matching was fairly straightforward with the obvious checks on the pattern. I lined the over-blouse with a bright blue synthetic lining, and acquired seven matching pink buttons for 5p each from Simply Fabrics. They are a bit cheap and slightly sharp, but the colour is perfect. So far I have worn it with my pink trousers and with deep blue jeans, and it works well. For the party I felt it needed to be a bit more showy. I had thought about a long skirt, with lots of shaping, or draping. But in the end I had ten minutes before I had to fly. I did something very quick, a bit slipshod (it’s not even hemmed), but hopefully still authentic. I took my remaining cloth and I cut it in two. One piece I tied around my waist. The other I wound round my head and tucked it in. This is pretty and awesome! I’m blown away. You look gorgeous! 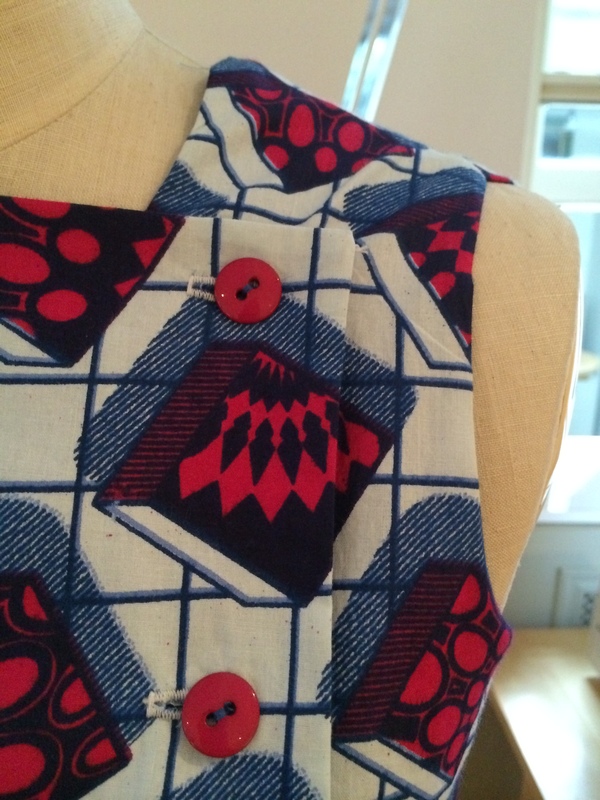 Thank you for sharing the construction details on the top – love the pattern matching on the front. I didn’t buy a peplum top in the shops either, as I’m not trendy really. This top I love as it is super chic and just a bit retro. And the fit…wow! Great job! You always give me something to aspire to. PS Your colleague’s look is gorgeous, too. Stunning! You do know how to have a good time in NH housing department. It’s not your regular office environment by the sound of it. Im late to the party, as I was out to my friends camp to finish covering her sofa. What fun!!!! love it and as said above, great job Kate. fun fun fun. I just love you were brave enough to go with the head wrap- excellent!! I wonder how you feel about the people that did not dress with any international efforts… ?? does this affect your view of them as employees? ?